A wild wolf picked up by campers north of Ketchum is on the move again, this time traveling from his temporary home in Boise to a facility in Williamsburg, Va. The Idaho Department of Fish and Game announced Wednesday that the 7-week-old pup has found a new home there at Busch Gardens. The facility was selected from a list compiled by staff at Zoo Boise, who determined which facilities might be able to adequately care for the animal. Busch Gardens has several zoos that are accredited by the Association of Zoos and Aquariums, though its facility in Williamsburg is not. The wolf pup was separated from his pack prior to May 25 when campers driving into Ketchum saw it sitting by the side of the road near Frenchman's Bend on Warm Springs Road. Suzanne Stone, spokeswoman for wolf advocacy group Defenders of Wildlife, said last week that the campers sat by the road for an hour to see if anyone would return for the pup—which they originally thought was a domestic dog. DNA tests returned positive last week, indicating that the pup is a full-blooded wild wolf. Stone and officials from the Idaho Department of Fish and Game searched for the wolf's pack even prior to the DNA test results in the hope of reuniting the animal with his family. Idaho Fish and Game Magic Valley Region Supervisor Jerome Hansen said as early as June 5 that the wolf's future was likely in captivity, though Defenders of Wildlife field technicians continued searching though June 10 for the pup's original pack, using helicopters and on-the-ground searching. "Our focus is on finding a captive facility," he said, adding that even if the wolf proved to be a hybrid, a captive facility would also need to be found. According to a Fish and Game press release, Busch Gardens has successfully maintained wolves for more than a dozen years, and currently has nine at its Wolf Valley facility. 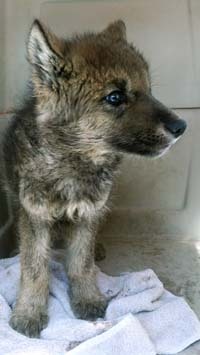 Busch Gardens also recently received two wolf pups, now 6 weeks old, that will form part of the Ketchum pup's new pack. Though Zoo Boise created the list, Idaho Fish and Game officials chose the pup's final destination. Zoo Boise did not return a call by press time Thursday to explain what factors led to the creation of the list, but zoo Supervisor Steve Burns told the Idaho Statesman on Wednesday that he had no say in the final decision. Fish and Game spokesman Niels Nokkentved said Wednesday that he could not comment on the decision-making process and that the staff member in charge of the project was on vacation. Stone said during a Defenders of Wildlife workshop Thursday that she is disappointed with the outcome. "Unfortunately, he is now headed to Virginia and is going to be stuck in captivity," she told Defenders of Wildlife staff as well as state wildlife officials. The pup was transferred from Zoo Boise on Wednesday.